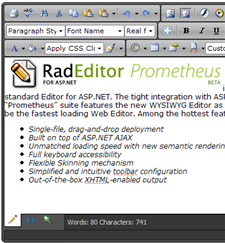 While the official Q2 2007 SP2 won't be available this week as planned, a new build of RadEditor "Prometheus" with most of the SP2 enhancements is available. The new internal build, dated October 25 (make sure you scroll down in the forum thread to download the correct build), delivers almost all of the enhancements mentioned in this week's SP2 post. The only features that are not ready in this internal build are the Table Wizard dialog, a few layout issues with toolbar modes, and a few missing localization points in the dialogs. All of these items will be addressed, though, before the official SP2 ships mid-next week. With this release, RadEditor "Prometheus" comes very close to duplicating all of the functionality in the original RadEditor. In fact, one of the only features that won't be present is docking toolbars (a feature that currently is not planned for the "Prometheus" version). So if you've been waiting for "Prometheus" to catch-up with the old Editor before giving it a spin, now is a good time to take it out for a test drive. Look for the final SP2 version along with SP2 updates for all "Prometheus" controls next week.